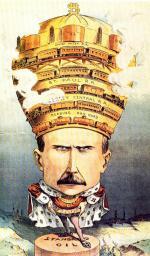 John D. Rockefeller, "King of the World," Puck Magazine, 1901. In 1899, investigative journalist Henry Lloyd Demarest jested that "The Standard Oil has done everything with the Pennsylvania legislature except to refine it." And in truth, since putting the Standard Oil Corporation together in 1878, John D. Rockefeller had bent and bribed the state government to his will. Three years after Lloyd published his article, McClure's Magazine began to publish a detailed expose' of Rockefeller's empire, written by journalist Ida Minerva Tarbell, that would shock and outrage the nation. The daughter of an oil worker, Tarbell in 1880 had graduated from Allegheny College in Meadville, then worked as a schoolteacher in Portland, Ohio, before returning home to Titusville to work for the Chatauquan, a local newspaper that championed the underprivileged. Never marrying, she began a cooperative household with three other women in the early 1890s, then spent three years in Paris working on a biography of Mme. Roland, a leader in the French Revolution, which Scribner's published in 1895. Spotting her talent, Samuel McClure of McClure's Magazine hired her and published her interviews with Louis Pasteur, Alexandre Dumas Jr., Emile Zola, and other notables. Ida Tarbell and McClure's Magazine cover featuring photograph of John D. Rockefeller. Between 1902 and 1904, McClure's published nineteen installments of Tarbell's detailed account of the history of Standard Oil: of the bribery, manipulation, cut-throat tactics, and criminal actions that had given Rockefeller a near monopoly of the American oil industry. The rise of Standard Oil was a story about Pennsylvania, for here the American industry had begun after the discovery of oil near Titusville in 1859, and here Rockefeller had made much of his fortune. Tarbell was far from objective: Her father was one of the small entrepreneurs Rockefeller put out of business in the Pennsylvania oil fields, and her brother William Walter Tarbell was an executive in the Pure Oil Company, Standard Oil's leading competitor. In addition to financing his sister's education and career, he also gave her much of the ammunition she used against Rockefeller. Tarbell demonized Rockefeller, and included inaccuracies in her account. She was right, however, about Rockefeller's power and ruthlessness, and his willingness to bribe legislators and drive competitors out of business. In 1904, McClure, Philips, and Co. released The History of the Standard Oil Company as a two-volume book. Pushed by public outrage from her account, the federal government in 1906 prosecuted Standard Oil under terms of the Sherman Anti-Trust Act of 1890. In 1911, the government won its landmark case. For the first time, the Anti-Trust Act had been used for the purpose it was passed, to break up a large corporation that engaged in "restraint of trade," rather than serve as the instrument that the courts and their business allies used to bust strikes and labor unions. 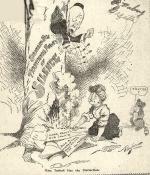 "Miss Tarbell has the Distinction," editorial cartoon, circa 1904. The History of Standard Oil turned Tarbell into a national celebrity. She was the most prominent woman among a new generation of investigative journalists whom President Theodore Roosevelt termed "muckrakers," "muck" being an old English word for excrement. Another muckraker to expose corruption in the Commonwealth was Lincoln Steffens, who also worked for McClure. In 1904, Steffens also published The Shame of the Cities, which documented political corruption in America's industrial metropolises. Steffens exposed the voter fraud, theft, patronage rackets, and other manipulations of the corrupt Republican political machines in Pittsburgh, and Philadelphia, the latter of which he famously labeled "corrupt and contented." These city machines had grown hand in hand with the enormous economic growth and urban expansion of the previous decades. Between 1850 and 1900, Philadelphia, for example, had tripled in population to 1.3 million people and in area through annexation of neighboring communities. Services and resources were needed on a large scale - schools, gas, electricity, waste disposal, transportation - and those who could control their purchase and sale turned huge profits for themselves, bribing the appropriate officials where needed. The work of Steffens, Tarbell, and other muckrakers helped fuel public demand for political reform in Pennsylvania's leading cities and in state government. The Republican state and city machines, however, would remain in power for decades to come. 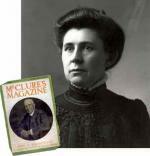 After her father died in 1905, and McClure the following year, Tarbell moved to Hartford, Connecticut, where she used her royalties and stock in McClure's to purchase the American Magazine. There she attacked the protective tariffs that by driving up the prices of imported goods enabled American corporations to rake in huge profits that all too often benefited neither workers nor consumers. After the courts dismembered Standard Oil, Tarbell became more conservative. Constantly writing books and articles, she urged women to stay at home to strengthen the family and repudiate the right to vote. She wrote a positive biography of Judge Elbert Gary, who helped organize United States Steel, and endorsed Frederick Winslow Taylor's scientific management schemes, on the mistaken belief that they raised the value and hence the salaries of skilled workers. She also wrote several works on Abraham Lincoln, but failed to achieve long-term recognition for any works after her history of Standard Oil. Kathleen Brady, Ida Tarbell: Life of a Muckraker (New York: Putnam's), 1984. Ron Chernow, Titan: The Life of John D. Rockefeller, Sr. (New York: Random House), 1998. Arthur P. Dudden, "Lincoln Steffens' Philadelphia," Pennsylvania History 31:4 (1964): 449-458. Jr. Kochersberger, ed., More than a Muckraker: Ida Tarbell's Lifetime in Journalism (Knoxville, TN: University of Tennessee Press), 1994. Josephine D. Randolph, "A Notable Pennsylvanian: Ida Minerva Tarbell, 1857-1944," Pennsylvania History 66:2 (1999): 215-241. Barbara A. Somervill, Ida Tarbell: Pioneer Investigative Reporter (Greensboro, NC: M. Reynolds), 2002. Lincoln Steffens, The Shame of the Cities (New York: Hill and Wang), (originally published 1904), 1957. Ida Tarbell, All in A Day's Work: An Autobiography (Champaign-Urbana: University of Illinois Press), 2003.